10.00 to 19.00 (March, April, May and October). 10.00 to 18.00 (January, February, November and December). We are comparing Montjuic Cable Car Ticket Prices from leading ticket suppliers and Try to find you Cheap tickets prices on the market. Taking a ride on Barcelona’s recently refurbished cable car is one of the highlights of a visit to Spain. With lush green hills on one side, views to the Catalan city centre on the other, and a glimmering blue sea at your back, a return trip on this cable car is a journey you’ll never forget. Once you’ve reached the top of Montjuic Hill you’ll have as much time as you need to explore. The best part about your flexible ticket is that you’ll be able to use it at any time that same day, so there’s no need to rush back down. Instead you can take your time to visit the hilltop castle (entrance not included), admire the views. Looking down on the Spanish capital you should be able to spot some well-known landmarks such as La Basilica de la Sagrada Familia, the harbour Fundación Joan Miro, and the Agbar Tower. When you’ve finished exploring just hop on into another car and take the 750-metre-long cable back to the city centre. Perfect for adventurous travellers and for those who like to find peace and quiet within the city. Suitable so groups of up to 8 or for individual travellers. Not ideal for people with a fear of heights. Your Experience With Montjuic Cable Car Ticket? 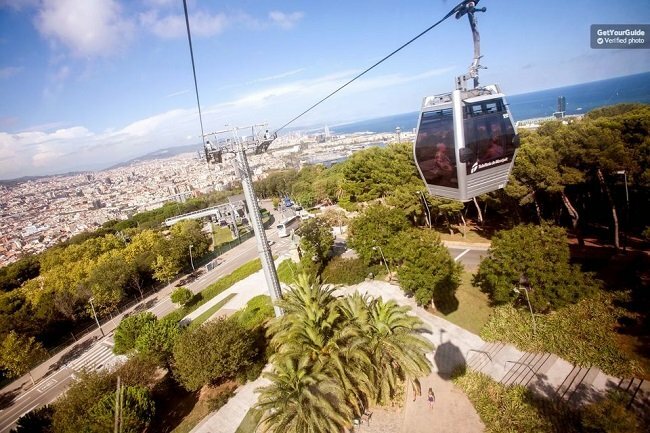 Travel in style to the highest point of Montjuic. Enjoy unrivalled panoramic views of the Spanish capital. Share the experience with your fellow passengers as you glide through the air in an 8-seat cabin. Take your time to explore the hilltop Montjuic Castle and take some stunning photographs. Return the same way you came up with a round trip cable car ticket. Choose to travel alone or with your friends and family and benefit from the freedom of a flexible transport ticket. What Montjuic Cable Car Ticket Includes? Round trip ticket for the Montjuic Cable Car. After taking the cable car to the top of Montjuic you can take your time to visit Montjuic Castle. We recommend bringing a sunhat and water during the summer months and a jacket in the winter time as it will be colder at the top than it is in the city. Travelers Reviews about Montjuic Cable Car Ticket? The Montjuic Cable Car has 4 out of 5-star reviews on Trip Advisor. On Get Your Guide it has an average 4.4-star rating and visitors who purchased their tickets from Tiqets have given the trip 4.5 out of 5-stars. Travellers have said that visiting Montjuic is worth the journey from Barcelona. Passengers have frequently described the views from the cable car as ‘amazing’ and ‘breathtaking’. Booking and ticket confirmation will be sent via email. Mobile or printed tickets are accepted. Get Your Guide’s cancelation policy states that full refunds will be issued for any cancellations made up to 24 hours in advance. Viator say they will issue full refunds up to 7 days in advance and partial refunds up to 48 hours in advance. Refunds are not available for reservations made with Tiqets. Entrance to Montjuic Castle and riding the funicular are not included in the ticket price. If your ticket is valid for more than one person then you must ride the cable car at the same time at the other person(s). Tickets may need to be redeemed before arrival at the cable car station. (You can collect your voucher from the ticket office on Av. Miramar 30, s/n). Meeting Point: Montjuic Cable Car Station (1st station). To reach the cable car station you can take the funicular from Paral-lel Metro Station.